My review: I waited and waited to read this. I don’t like reading a book on its release day if it’s the end of the series or if I have to wait for what seems like forever to read the next one but I read this one a couple of months after it was released. I am very happy that I read it and also happy that I waited to read it as waiting made it all the more exciting for me when I finally got round to hearing about Ashwini and her infamous Cajun vampire. It was so sweet! 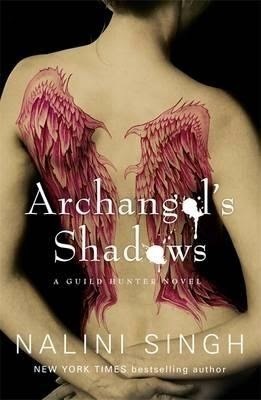 Archangel’s Shadows had the right balance of dark and dramatic as it did light and fluffy. Light and fluffy was Ashwini and Janvier’s absolutely astounding relationship – many years hunting each other would do that to a couple I guess – they had the perfect mix of sarcasm, romance and love combined with them facing the hardship of their duty and the difficulties that Ashwini faces herself with her health. The entire book had, in my opinion, everything a good story needs. It had main characters who have a good and flowing relationship, secondary characters (though main in other stories) that held up their sides of the story and the continuation of other stories, a very good plot and good descriptions that didn’t run away from the writer. There’s something bad happening in Manhattan and it isn’t a good time for it, after the battle between Raphael and Lijuan that caused more problems than it solved, the city needs healing and not breaking. There’s a renegade angel who is paired up with a renegade vampire and they’re going around killing women or cattle as some of the old immortals call us lowly mortals. It’s Ashwini and Janvier’s job to hunt them down and hunt they do – the hunted becomes the hunter in Janvier’s case and it was oh so good. I love me a Cajun. Overall, very well written and I can’t wait for Archangel’s Enigma’s release day as I’ve got more of a taste for Naasir.